Shannon Breeze is located alongside the heritage towns of Ballina/Killaloe on the banks of Lough Derg. 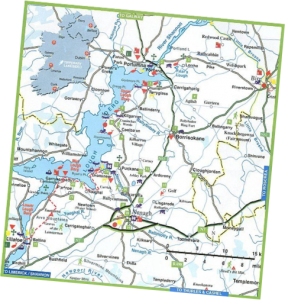 Also just 5 minutes away, Killaloe is an open air watersports playground with fun for all ages – cruising, wind-surfing, sailing, kayaking, fishing, canoeing. A myriad of other local activities include: golf, pitch & putt, bird-watching, tennis, horse-riding, heritage walks, hill-walking and cycling. Let Phyll and Noel advise you on all aspects of the local area and amenities. It is the ideal venue for touring Counties Clare, Limerick, Tipperary and South Galway. All of the following regional attractions are within within easy day-tour reach. Shannon Breeze B&B, Inchadrinagh, Ballina/Killaloe, Co. Tipperary, Ireland.